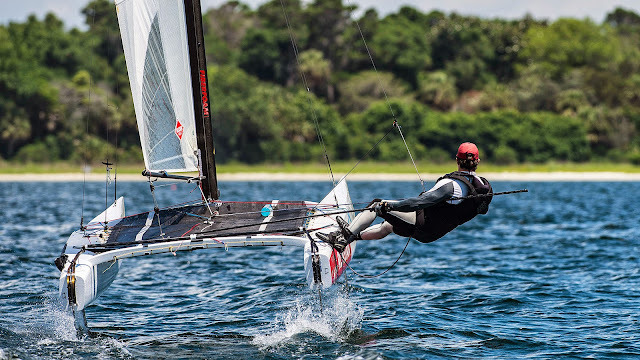 Matt Struble leads the 2015 North Americans at Panama City, FL with 3 bullet under his belt. Racing Ben Moon's Ronstan Exploder, Matt has being able (after much work on the boat as I've been told) to grab the pace of a foiling A for the first time. But Matt knows 1 thing or two about racing & technical details, he is 2013 NA Champ sailing with his own built design. Second place for 2014 North Americans Champ, Bruce Mahoney, with a DNA 2015 latest tech, Bruce scored three seconds behind Matt. Still much to go but Bailey White, Class president & currently in third place (3,3,4) and also with Exploder told me he was impressed on how Matt adapted to a new boat and foiling mode so fast , he is faster and pointing better foiling downwind than the rest of the fleet.